If you’re a dog lover, or someone who appreciates humor in mysteries, Spencer Quinn’s Dog On It is a must read. The book introduces two of the most lovable characters I’ve met in recent mysteries, Bernie Little, founder and part owner of the Little Detective Agency, and, most important, Chet, the narrator. Chet is a dog. Chet doesn’t speak. He doesn’t do anything that isn’t dog-like. But, he is a full partner in Bernie’s life and business. And, Chet tells a very good story. Bernie is divorced, and owes alimony and child support. The business has been relying on divorce cases lately, but, according to Chet, they specialize in missing persons. When Cynthia Chambliss wants to hire Bernie to find her missing fifteen-year-old daughter, Madison, he’s a little reluctant. Madison might not have come home from school, but she hasn’t even been gone overnight. And, Bernie is right because Madison shows up with some story about a movie she saw. The case is over, but Bernie knew Madison lied. When Madison disappears again, Cynthia returns to Bernie asking for help. This time, Cynthia's ex-husband becomes involved, insisting Madison just ran away to Vegas. Bernie and Chet dislike Madison's father, Damon Keefer, immediately. Bernie has problems with developers, and Damon is not only a developer, but he doesn't seem concerned enough about his daughter, a girl that Bernie and Chet both liked. Something is definitely wrong in Keefer's story. 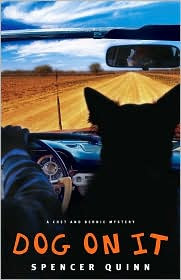 As Bernie and Chet investigate, followed by Suzie Sanchez, a reporter who wants to write a story about a day in the life of a private investigator, the case takes an unusual turn, heading for the desert. And, all three of these characters show unexpected resourcefulness. As I said, this is a must-read for dog lovers. If readers don't laugh aloud at Chet, they will at least be smiling. Chet's adventures with a group of bikers, and his day at the golf course are wonderful parts of the book. And, Bernie is not the loser that he appears at first glance. He has some hidden qualities that serve him well. I can't recommend Dog On It highly enough. Chet is one of the best narrators since Danny Boyle in Chris Grabenstein's Ceepak mysteries. This book is a treat. And, it's even a bigger treat to know this is the first in a series. Dog On It by Spencer Quinn. Atria Books, ©2009. ISBN 9781416585831 (hardcover), 320p. Ok - You had me at the title, and then the review just confirmed it - I must read this book. Being the proud owner of 3 yellow labs (and having survived 3 litters of puppies so far), I think I can classify myself as a dog lover. By the way....I found a copy of Joann Fluke's first mystery last night at the bookstore and purchased it immediately. Your review - and the comments after - confirmed that this is a series I need to start. Drop by my blog...I have something for you. Oh, Molly, you're going to love Chet, and the story! Can't wait for you to read it. And, let me know what you think of Joanne Fluke's book after you read it! Thank you, Wisteria! I'll be dropping by in a couple hours. I have 45 minutes to do things this morning before I get ready for work. Thank you! I so want to read this one!! Great review. Thanks, Julie! Loved this book. Let me know what you think after you read it. I've been following this author on Twitter -- Chet is quite the character. Good to know you like the book so much. Rhapsody - If you're interested after my review, I hope it's still on sale. Gwendolyn, I follow Chet, too. He's even better in the book. I have had my eye on this book for a while! You're helping push me over the edge!!! I wonder if it is available in audio. I'll have to see! It might make a good road trip book. This would be a terrific road book. Hope you can find it. Well I DID buy it in Barnes and Noble when they were running their special and I loved it. There are a couple fairly implausable things, but who cares? It's a fun read. Hope the hand gets better fast! Thanks, Caryn. Hope I can type again Monday night.